Universal Medical College Hospital has a new name (from its former name Aysha Memorial Hospital), a newly look modern premise and most importantly a modern mindset of adopting the latest medical practices. The owners of the hospital also don’t shy away from spending on significantly in adopting latest technologies as the Fintech team found out when it went to meet the MD of the Hospital Dr. Ashis Kumar Chakraborty. Here is an excerpt of the interview for our Fintech readers. 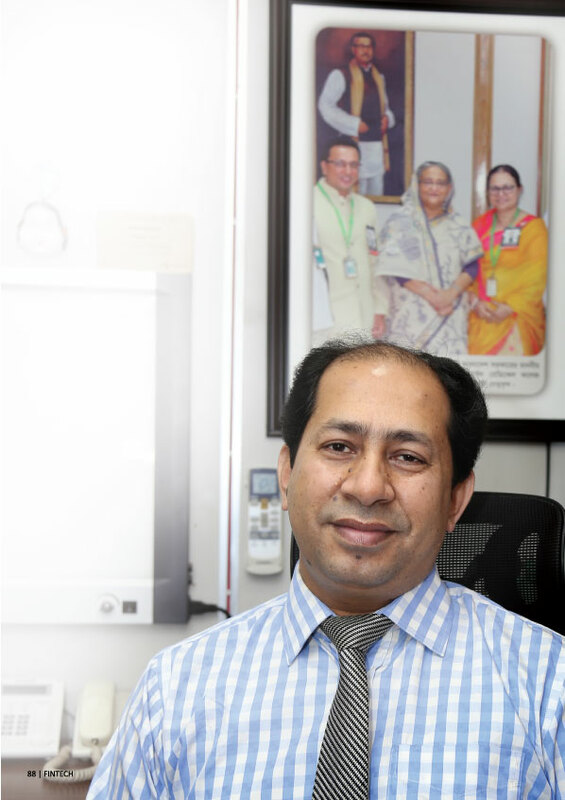 FINTECH: Universal Medical College and Hospital, formerly known as Aysha Memorial Hospital, has played a huge role in advancing the medical sector in Bangladesh in recent years. Can you walk us through the journey from where it all begins? Ashis Kumar: I began my professional career in the medical sector in 2000, after completing my M.B.B.S from Comilla Medical College. I started working as the Chief Medical Officer for Christian Missionary Hospital in Brahmanbaria. In 2004, my older sister, Priti Chakraborty, mentioned that she would be willing to buy Aysha Memorial Hospital if I was willing to step up and take responsibility for it. Now, AMH had been around since 1996, and it was a well-established institution that did really well at the beginning, but its reputation fizzled out in public as they were not able to maintain their quality of work. I thought it was an excellent opportunity, so I agreed, and joined as the Director in 2004 and our journey began. At first, we were just a general hospital with a 40-bed capacity for patients. Since then, we’ve come a really long way, and phase by phase, we have improved AMH after taking over. We can boast of not just contemporary state-of-the-art facilities, but also availability of some of the most modern medical techniques and procedures. From X-ray to MRI, angiogram to angioplasty, we offer some of the most crucial medical services, for which people had to travel abroad before. In fact, recently we started offering Primary PCI procedure, which is the latest medical service for cardiac patients around the world. Right now, one of our biggest accomplishments is that we have a training institute for doctors and nurses, apart from a nursing and research institute as well. One of the biggest complaints we’ve heard throughout the years is that doctors and nurses in our country do not know how to behave with patients, or don’t have proper medical training to work at a hospital, they just know the textbook stuff. So it was our dream to open a training institute for professional development in the medical field, and I don’t have words to explain how impactful it has proven to be. Our dream has come true. Our first batch obtained 2nd professional examination and had a 100% pass rate, which is extremely rare and unbelievable for a medical college. Dhaka University has a ranking for top 49 medical colleges in Bangladesh, and we stood in 5th place. In fact, our 2nd batch to take first professional M.B.B.S exam had a 80% pass rate! All these accomplishments have really put us in the spotlight in the medical sector. There’s a lot of factors behind our successes of course, but a big role is played by our rich faculty. Our principal is one of the most famous anatomy specialists in Bangladesh, our Head of Surgery is Prof. Dr. Feroz Qader, who is a star surgeon in the country, then we have Prof. Ehsan Mahmud, who is Head of Neurosurgery from Dhaka Medical College, and recently we confirmed that Prof. Redwanur Rahman, one of the prominent medicine specialists and international clinical researcher has joined us. One of our specialties is our critical care management systems. We have ICUs for patients ranging from 0 to adult age range, and we have patients referred to us from all over the country. Our social work is also highly praised and notified in the country, like our ‘GorobiniMaa’ program where he held a concert at the army stadium, which is not something most medical institutions would host. Another CSR activity we hosted was a scholarship program in Brahmanbaria named “Ashutosh Chakraborty Smarok Shikkhabritte”, where we offered merit-based funds to students from renowned school of Sarail. Another thing we really take pride in is that we are a very media-friendly hospital. From journalists, to actors, actresses, directors, and everyone in between, is welcome to avail our services without any hassle. In fact, we provide medical care to every patient who comes to us, irrespective of if they’re traffic accident or trauma patients, or if they are political cases, abuse cases, gunshot victims, or even abandoned victims, whose families we cannot trace or guarantee payment of services. We believe it is our duty to care for all people and we do our best to stay to our belief. This is not something you can expect from most private medical institutes, as they often avoid patients or victims that fall into these categories. Recently, we offered free-services to over 5,000 people at the ‘Aikor Mela’ and we visited the refugee shelters in Cox’s Bazaar to do a health survey on the Rohingya refugees as a part of our research institute. These are the kind of things that we feel proud to do, nothing we do is with a business objective, our motto is to be absolutely service oriented, and then whatever business comes out of it is just a byproduct. In a nutshell, this is where we stand, and this is what our journey has been so far. FINTECH: What are some of the latest equipments and services available at UMCH? Ashis Kumar: UMCH is extremely technologically advanced in terms of service and equipments. We’ve got first digital MRI and the latest Cath Lab solutions with which we can do rotational angiography, peripheral angiogram, primary PCI angioplasty, and it’s open 24/7. Our nursing institute’s first batch has already graduated and started working in the nursing field. Our motto is that M.B.B.S and humanity equals to a doctor, just having a degree doesn’t make you a doctor, you’ve to understand your patients, you’ve to be compassionate, we really believe in that. Our aim is to provide the best services and ensure that we retain our talents within the country, so we can benefit our economy, our society, and our people. There have been instances where people went abroad to Singapore or Malaysia for treatment and came back to me with their reports and I said, “hey, we have all those tests available here.” They wouldn’t believe it! Besides, it cost them so much more to travel to a new place for treatment, when they could have easily availed the same services at a cheaper cost in their own home. That’s why having the latest technologies and services is so important for us, we want to change how people perceive medical treatment in Bangladesh. FINTECH: What would you say is one of the biggest setback in the medical sector in the country? 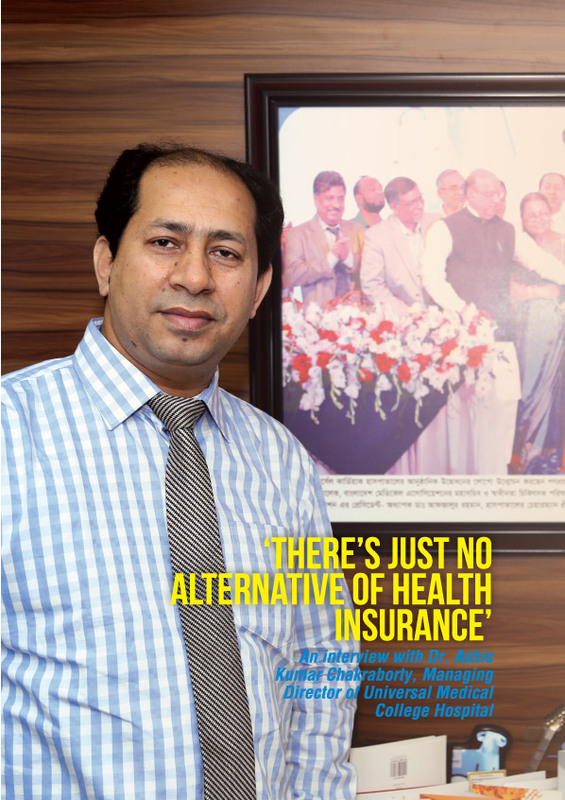 Ashis Kumar: I strongly believe that the biggest setback, or the biggest issue creating discrepancies between doctors and patients, is the lack of health insurance. People who live in other corners of the world have the comfort of proper health insurance and that encourages them to go to their doctors, trust their doctors, and seek treatment. However, in our country, despite having professionals in the field who are more than capable of offering modern medical cures and services, patients are reluctant to seek treatment as they are unable to afford it. This shouldn’t be the case at all. I have spoken at various seminars, conferences, with medical officers, ministers, politicians, I’ve told them all the same thing; a proper implementation of health insurance and healthcare system would save our medical sector. There’s just no alternative to health insurance. Another thing I mention is private public partnership (PPP), where the government could offer yearly subsidies to institutions like ours to provide medical services to patients from lower income families at subsidized rates. I believe that too would be a big step towards bridging the gap between doctors and patients and how medical service is perceived in this country. One of the biggest issues that create unrest in the medical field in our country is based on money. This isn’t the case anywhere else in the world. Abroad, doctors and patients only talk about their medical histories, then they give their health insurance card and their bills are sorted out. In our country, patients and doctors get into arguments over bills, patients get angry and call the media, there’s civil unrest, buildings are broken, transports are burnt down, and in a fortnight an institution loses their business or reputation over small matters. Nowhere else in the world will you find a scenario like this. Elsewhere, if patients are dissatisfied with service, they sue the institution and matters are settled in court. Negligence of patients is probably one of the biggest issues they face, but there’s no civil unrest, just proper legal procedures taken to solve the issue. Why’s that? It’s because there’s a certain degree of professionalism and lawful order monitored by governments and institutions, that we lack here in our country. FINTECH: Do you think there has been a significant amount of progress in the medical field over the last decade? Ashis Kumar: Yes, absolutely. Despite the setbacks I mentioned earlier, I believe that the advancements in our medical sector over the past decade has been exemplary, and we haven’t seen so much progress in such a short time ever before. Before, there were instances where ministers and politicians had had to sleep on the floor, waiting for treatment, or people being flown into another country overnight for treatments like angiogram, angioplasty etc. Today, we have access to almost all modern treatments here in our country, we have over 30 cardiac centers in the country including ours, we have done over 2000 successful angiograms, and successful angioplasty with 500 cardiac surgeries, we’ve just become very capable of providing the latest medical services in every regard. For example, if Donald Trump or Barack Obama were to have a heart attack, the treatment they would receive in the United States, is the same treatment we are capable of providing to our citizens today at our institution, and that too at an affordable cost (Primary PCI). 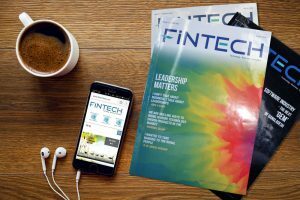 FINTECH: What role do you think the media has played, or can play in? Ashis Kumar: I believe that if the media and journalists reported more on those stories, highlighted our achievements more positively in the media, we would have more people putting their faith on us and coming to us to avail our services, and most importantly, they would realize how far we have come as a nation today. I urge all journalists to be more positive about the way they represent us on media, there’s a lot of professionalism required in both our fields, as doctors, and as reporters, and we need to work closely. We need to have less instances of journalists taking photos without doctor’s permissions, sharing them online with ridiculous captions like, “Doctor falls asleep at work! !” which results to doctors going on strike the next day! Who are the ones affected by these incidents? Casual citizens who only seek proper treatment. We need to have more empathy for each other’s work, we need the media and the doctors to work together, and if there’s something that we find lacking, we can offer suggestions on how we could be doing better, rather than creating rifts. In a nutshell, I believe that maintaining a standard level of professionalism in the way we all treat each other, could be very beneficial for the advancement of our country. FINTECH: What are some future projects that you are currently working on? 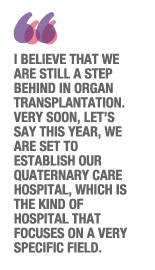 Ashis Kumar: I believe that we are still a step behind in organ transplantation. Very soon, let’s say this year, we are set to establish our 500 bedded quaternary care hospital, which is the kind of hospital that focuses on a very specific field. It will focus on organ transplantation – liver transplant, bone marrow transplantion, and it will be an intensively professional institution, and one of the most competitive ones established in the region. So that’s currently our big dream, it will be called ‘Universal the Medi City’ – like one umbrella where you can avail all medical services, and we can collaborate with other renowned global medical institutions. FINTECH: You mentioned earlier about the cardiac unit here, is that the primary specialization focus of this institution? Ashis Kumar: Primarily we are a general hospital, but our special focus is on critical care medicine and cardiac units. 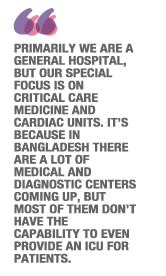 It’s because in Bangladesh there are a lot of medical and diagnostic centers coming up, but most of them don’t have the capability to even provide an ICU for patients. That’s why, from the very beginning, we have ensured that we have the capacity to provide utmost medical care to every patient, from NICU pediatric ICUs to cardiac centers, we wanted to make sure that every kind of patient can have a space to be cared for. I believe that every discipline in the medical sector requires a specialized focus, and we aim to provide that to our people. See, there are people who travel abroad and spend 40 lacs in Singapore for a cardiac surgery, while here you can spend BDT 2.35 lac for 10 days, including private cabin rooms, and complete your successful surgery. These are possible. We just need to change people’s perceptions about the way they view medical care in this country and that they start having more faith in their own doctors. FINTECH: You’ve this slogan, “Leader in healthcare and integrated healthcare systems worldwide.” Do you really think this could come true in our country? Ashis Kumar: I absolutely believe so. See, most of the complaints we hear about our medical field is surrounding people – doctors aren’t behaving well, nurses aren’t taking proper care, no one is actually complaining about the machines or the treatment. People can definitely be improved, right? That’s what we aim to do with our training centers. Of course, people don’t like change, they are resistant to it, but through our training institutes we aim to improve the way doctors and nurses interact with patients in this country, and therefore aim to provide more professionalism in our attitudes. I believe that can play a big role in changing perceptions and help us stay true to our slogan. FINTECH: Can you tell us more about the kind of softwares, core systems and technology systems utilized here? Ashis Kumar: We are working on integrating ERP system in our workforce. We have moved to using softwares for our billing system, accounting system, patient entry data system, but we are just one short step away from becoming a completely paperless environment, due to lack of proper infrastructure. But, we are working on ERP systems. We have an amazing website in place right now, we have launched online appointment booking systems, and soon we hope to have an online pharmacy as well. In fact, we plan to have this sort of pharmaceutical system where the doctor mentions the medicines, the nurse jots them down in the system and is received by the pharmacist, who will pack them in a box and put it inside this vacuum pipeline sort of machine, and the box of medicines will appear on the respective doctor’s desk. Isn’t that amazing? We really hope to bring that into our country soon. FINTECH: Finally, what is your future vision for this institution in the next 5 to 10 years?